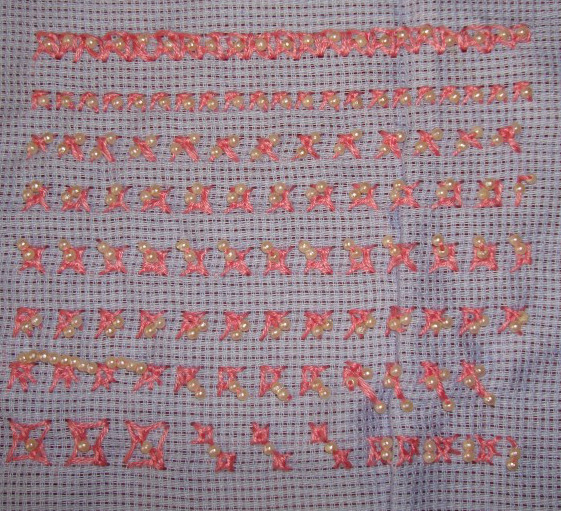 1.The first row is the version of beaded eastern stitch worked by SharonB. She has given some suggestions to work this stitch in different ways. In the second row, starting the looping thread with a bead, after the loop is made, the thread is inserted into the bead again. The beads are worked on the foundation bars, and the loop is made between them in the third row. 2. The beads are worked on the bars in the first row, the loop is worked keeping the beads in the corner. The beads are worked with a straight stitch in the meeting point of the foundation bars in the second row, the loop was made after that. The loop is started with a bead and ended in another point with another bead. 1.Eastern stitches are whipped with beaded thread.2.two beads are added at the end of the looping thread.3. The looping thread is worked longer and beads are added.4.5.two eastern stitches are worked in two ways with bead in between them.6.beads are worked between eastern stitches in the last sample.